VMware has announced a new version of vSAN 6.7 which brings some highly awaited new features such as HTML 5 Web UI based on the Clarity UI. The product’s UI has redesigned the UI to be more efficient and simplified. Moving forward, the Adobe Flash version of the client will not receive further updates. VMware vSAN is number 1 HCI solution. VMware claims over 10.000 clients. There is more and more adoption by current VMware clients and new clients which virtualize their physical infrastructure. vROPs integration has been announced already a few weeks back with VMware vRealize Operations (vROPs) 6.7 and we have reported in details on that. 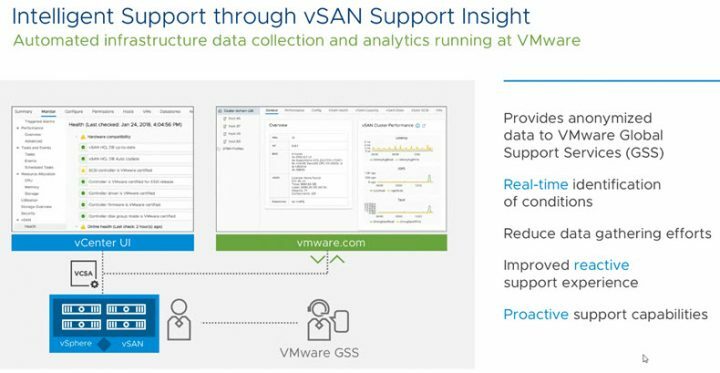 VMware vSAN 6.7 is fully integrated with vROPs 6.7 allowing to benefit from the latest innovations. 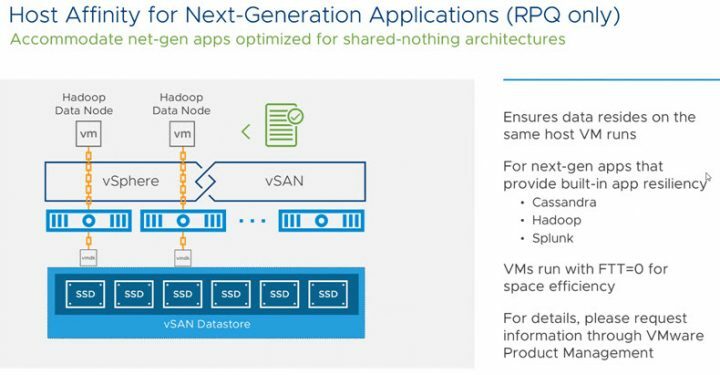 VMware vSAN 6.7 What’s New? Adaptive Resync – dynamic management of resynchronization and VM traffic. While the previous release of VMware vSAN allowed putting a manual threshold on the resync operations and also to split large components during redistribution, the vSAN 6.7 goes much further and allows adaptive resync. Adaptive resync will ensure that a fair allocation of resync resources are available for VM IO (IOPS consumed by VMs) and resync IO (IOPS consumed by the backend storage tasks). It all will happens during dynamic changes and load on the system. The adaptive resync will guarantee the level of bandwidth to ensure that specific traffic type will not starve from resources. Faster Destaging – VMware has improved the in-memory handling of I/O during destaging. In fact, during the destage process from the write buffer to the capacity tier. So the buffer is available for new IOs much quicker. This optimization provides better performance not only for VM I/O but also for the resynchronization I/O. Opens up fault domain as a target for other objects during decommissioning. It also looks for the smallest component to move. As a result, there is fewer data rebuilt and less temporary space usage. Space efficiency improved via New Object Provisioning – It brings new behaviors with swap file objects for space efficiency. The new swap objects are thin provisioned. VM swap now Thin provisioned (previously an advanced parameter had to be set on a per-host basis). 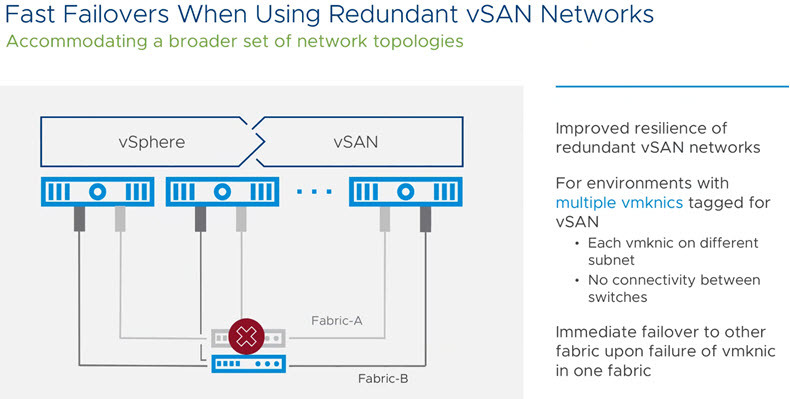 Fast Failovers when using Redundant vSAN networks – An Improved resilience of redundant vSAN networks. New logic has been introduced. 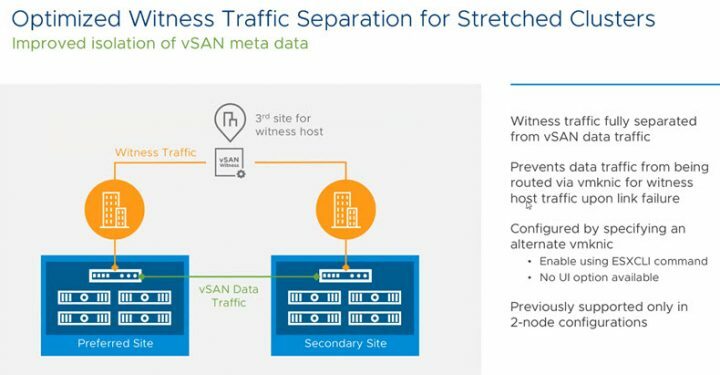 Optimized Witness Traffic separation for stretched clusters – if you’re running an architecture with a stretched cluster environment, you’ll have a possibility now to benefit from the improved separation of witness traffic from vSAN data traffic. The new improvements will prevent data traffic from being routed via vmknic for witness host traffic when there is a link failure. It’s configured by specifying an alternate vmknic (by ESXCLI command only in this release). This was previously supported already for 2-Node configurations. Failure handling improved in case of stretched cluster architecture – you’re in a situation of a site isolation. The inter site link is down (ISL) but also the link to the third site where the witness is located, is down as well. In order to track the component health properly, in a situation when the connectivity to the Witness site is back again, vSAN will track the fitness of each site after full partition event of the Preferred site. The secondary site is maintained as an Active site until ISL connectivity is restored. It prevents false positives when the ISL is not “up”. Host Affinity for Next-Gen Applications – you can now “pin” a VM to a certain node. The system makes sure that data stays on the same host that VM runs. Stretched Cluster Efficient Resync with Proxy Owner – this feature’s goal is to reduce inter-site traffic. It minimizes the data which travels across WAN link. It designs a proxy owner on the target site (Site B in our example) which takes advantage of local resync. The partial resync will sync active replica across ISL. It will establish proxy owner to manage local resync. Resync of the replica on site B will occur from a local copy. vSAN Support Insight – when enabled, the data are anonymized and then uploaded to VMware. And it is VMware which is able to help when you’re experiencing problem or performance struggle. The pieces of information (such as names of hosts, or VMs) are changed before that information is uploaded to VMare. Health Checks Additions and Improvements – there are some improvements on the health checks for vSAN 6.7 as well. Those health checks are very useful to troubleshoot or avoid problems. Enhanced Diagnostic Partition (coredump) Support – for diagnosing issues properly, there is a coredump partition. It is a special partition for diagnostic purposes. VMware vSAN 6.7 is automatically extending this partition when needed, depending on the host requirements. 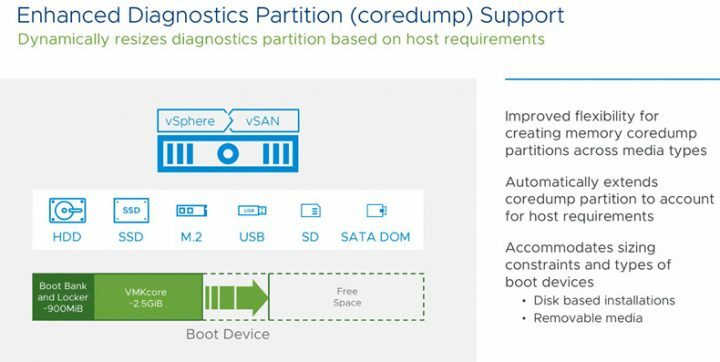 vSAN 6.7 needs larger coredump partition so it is able to automatically resize the coredump partition. Support for 4Kn Disks – those are a large disk which has a better price per GB than 512e and 512n disks (supported already by the previous version of VMware vSAN). New 4kn disks are supported and the vSAN data plane I/O is optimized for 4Kn. There is a software emulation for 4Kn. Improved Security with vSphere FIPS 140-2 validation – VMware VMkernel cryptographic module v1.0 has achieved FIPS 140-2 so vSAN 6.7 takes benefit of this. It uses this FIPS 140-2 validate d cryptographic module implemented already in vSphere. 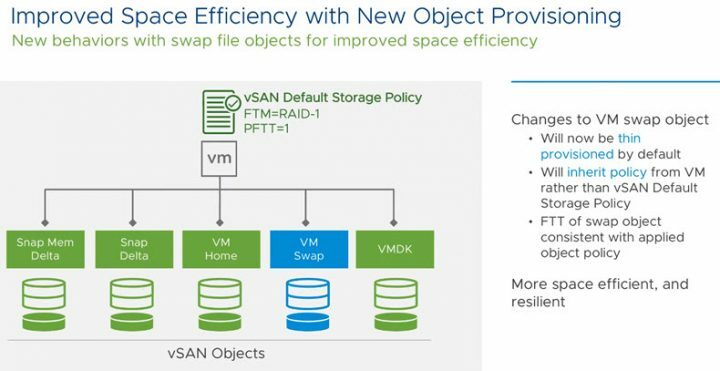 vSAN 6.7 brings some significant improvements over previous releases and we are really excited about it. 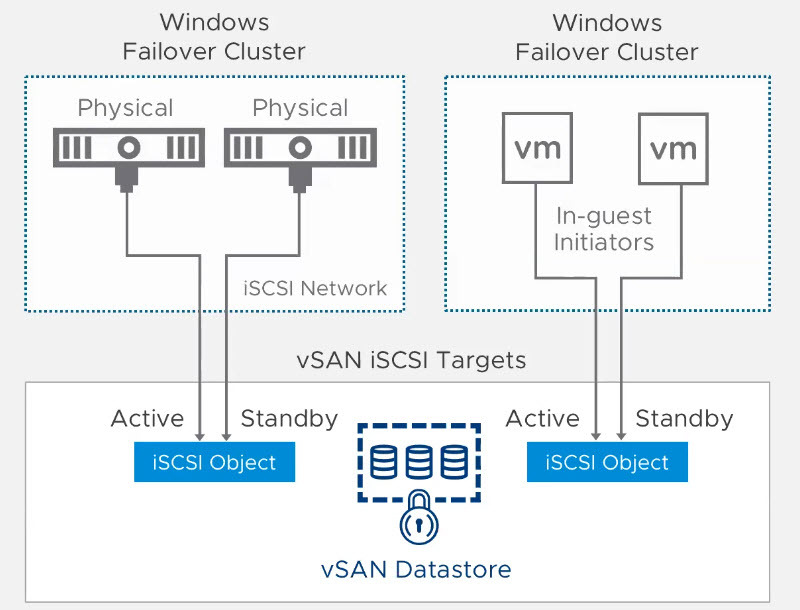 We do not have any information about when this version of vSAN will become available. 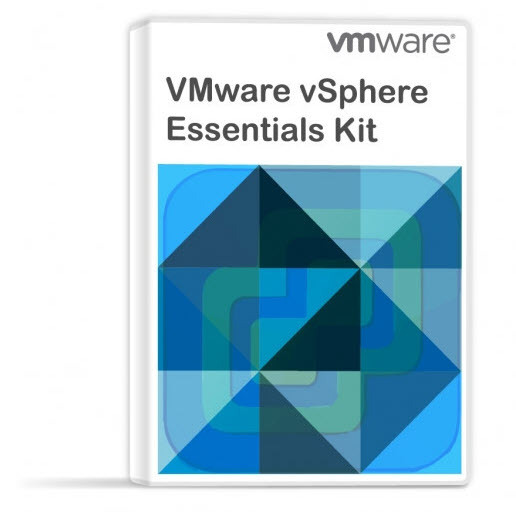 Perhaps it will be part of next version of VMware vSphere. Usually, VMware announces new versions of products and then a few weeks later there is a release which is available for download. So far this is all we can say about VMware vSAN 6.7. We hope that you had a good read and you have subscribed to our social media channels to be informed about some updates about this very hot HCI technology. We run vSAN in the lab, as 2-Host cluster connected via a 10GbE switch. Third ESXi host is running the nested ESXi Witness host, as well as our core network services (DNS, DHCP, AD etc…). The third host is outside of the vSAN cluster (requirement), so basically our core services do not have any kind of HA (we would need a 4th host…). What is VMware vSAN Disk Group? What is VMware Hyper-Converged Infrastructure?